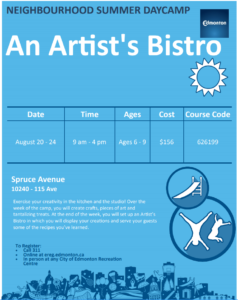 Attend a summer camp here in Spruce Avenue! View the poster. tantalizing treats. At the end of the week, you will set up an Artist’s Bistro in which you will display your creations and serve your guests some of the recipes you’ve learned. Arlene Gibbons on Plant Sale in Spruce Avenue! Welcome to Spruce Avenue Community on Happy July!